A civil engineer-turned-wine expert, McCoy hosts casual wine-pairing dinners around the world that are informative, inclusive, and snob-free. On an August evening in the Crown Heights neighborhood of Brooklyn, Cha McCoy poured a crisp rosé from Italy's Marche region for two long tables of guests, most of whom were, just one Crémant de Bourgogne ago, strangers, but were now convincing as family. At The Communion, the casual pop-up wine dinners McCoy throws throughout New York and the world, guests learn about wine varietals and producers in warm, low-key atmospheres while enjoying multi-course meals. The dinners have become one of the safest spaces in a notoriously intimidating world—as in, you can ask what "tannins" mean and McCoy will break it down for you, devoid of pretension. Or you can just sit and enjoy your Fiano di Avellino and steamed mussels, and perhaps make a friend. Synched with five courses of Café Rue Dix’s French-Senegalese fare, this summer's Afropunk edition of Communion showcased McCoy's unique wine sensibility. Many of her pairings draw from her own experiences—like living in Italy, the place she first realized that wine was magic. A trained civil engineer who had worked in a corporate capacity for years, McCoy experienced an existential shift in Rome, where she lived from 2010 to 2012 to earn her MBA. There, the inevitible happened: she fell deeply, madly in love with wine and the way Italians drink it: gathered around food. Within a matter of weeks, McCoy had built a community of friends and could confidently say she knew her way around a falanghina. "We would all bring wines and cheese and prosciutto, and that kind of lifestyle brought people together. That’s how I ended up meeting people in my neighborhood," says McCoy. "The group could be ten to twenty people, based on whoever was available. So The Communion started as an ode to that memory of my lifestyle to Italy." But it wasn't until McCoy attended her first wine festival that she decided she needed to devise a scheme to make wine her career. "On my way back home, I didn’t want to go back into corporate," she says. "So I thought, 'Ok, how do I continue drinking at 10 a.m.?'" Alas, the wine business isn't all morning-drinking in parks and nibbling on cured meets, and McCoy took her career pivot just as seriously as she did her previous ventures. She'd learned quite a bit about Italian wines from her sojourn in Rome, but she needed to study the rest of the world—the Big, Important Wine Regions, yes, and the emerging ones, too. When she returned to America, she took a second job at The Winery in Harlem to start her education. "I didn’t even know where Burgundy was located," she says. "I felt like I knew all this stuff because I came with Italian wine knowledge, but I felt completely out of water. 'Don’t ask me about Oregon Pinots; I didn’t even know they made wine there!' I could only sell one section in the whole store." That changed. Wine industry veteran Eric White became her mentor, exposing McCoy to the certifications she would need to gain legitimacy in the industry while expanding her palate and knowledge. She held her first communion in March 2017, inviting her girlfriends over to her apartment for wine, meats, and cheeses, Italian style. As the dinners continued, McCoy sought out up-and-coming chefs to cook for them. "I thought, 'How can I highlight women chefs? Women in the food industry? Chefs of color? How can I use my small little platform?'" she says. "One was lady with a catering business, and I let her freestyle and do something a little more creative—as if this was her pop-up restaurant at the same time." This summer, after balancing a strange double life as wine event organizer and corporate employee (she had to pay the bills), McCoy launched her hospitality business, Cha Squared, and earned some vital certifications, thanks to hundreds of hours of studying and, well, drinking. She's a certified sommelier from the Court of The Master Sommeliers, and this summer, she completed her Level 3 Wine & Spirit Education Trust exam. She says she never wants to give anyone a reason to delegitimize her credibility, which is paramount in an industry that many feel is exclusionary. 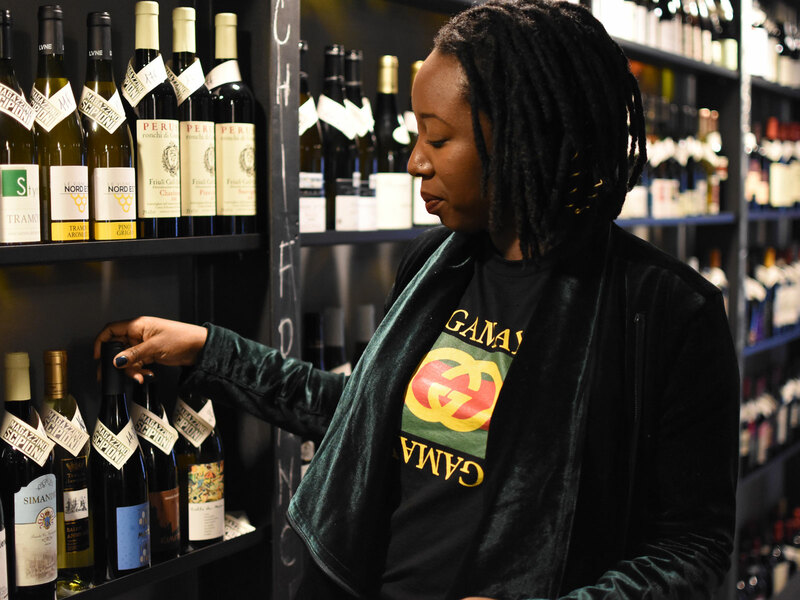 As a black woman in a mostly white, mostly male wine universe, she feels she has a lot to prove. She is driven by the desire to spread the joy of great wine to people who may have felt intimidated or excluded. "I have an engineering background, so I'm used to being the only black female in the room; it's my usual day," she says. "My mind is like, 'How do we get more people to be exposed to this?' That’s how I see the Communion—no one who knows how to pronounce 'sommelier' correctly, but they’ll get that expoure. They may see it and think, 'Oh, I could do that, too." One day, she'd like to open a wine bar with a relaxed, neighborhood vibe, probably in the Harlem or Bronx area. Right now, she's focused on building her brand and making connections in the industry. "I'm tired of waiting to get a seat at the table," she says. "I'm going to build my own table." On October 27, McCoy is hosting a Communion in Madrid, and this winter, the event returns to Harlem, where it all began.